Your home’s ductwork plays a major role in the overall efficiency of your heating system. In fact, experts say that as many as 75% of the residential duct systems in the Triangle area are currently operating below standards. Homeplace Heating & Air has over 30 years of experience in designing, installing, inspecting, and repairing ductwork systems, which makes us your perfect choice for all of your ductwork needs. Ductwork systems that are properly designed for older furnaces and heater units will often be inadequate for newer replacement systems, causing restricted airflow, lower efficiency, higher utility bills, and even accelerated wear to your new system over time. The joints in older ducts may not have proper seals, or these old seals may have deteriorated, causing air leaks which also hurt the efficiency of your system. Finally, the overall design of your ductwork also plays a huge role in allowing your heating system to function as designed. At Homeplace Heating & Air, we provide complete ductwork services to the greater Raleigh area. Because most systems that are more than 5 years old will likely have leaks in their ducts, we will check your system and fix any such leaks with mastic seals. If you are installing a new heating system or furnace, we will change your existing duct system to accommodate your new unit, whenever possible. In the event you need a whole new set of ductwork, we will expertly design and install a custom trunk line system for optimal efficiency and quiet operation. No matter your ductwork needs, Homeplace Heating & Air will provide the best quality work available with personalized customer service. 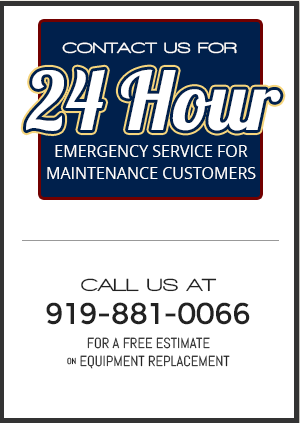 Call us today at 919-881-0066 for a free estimate and let Homeplace Heating & Air handle all of your ductwork needs.